A family-run business in Strichen is celebrating after being crowned the Scottish Butchers Shop of the Year for the second time. 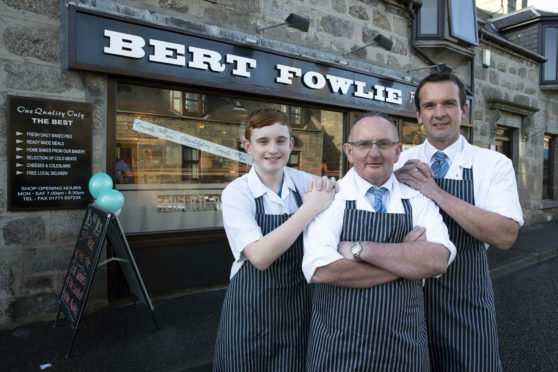 Bert Fowlie’s store on the High Street has carved a niche for itself by picking up the accolade for the second year in a row. 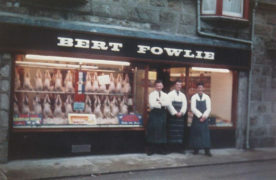 Owner Hebbie Fowlie who took over from his father in 1955 said it was “outstanding”. He added: “We’re just a wee shop in a wee village. “The quality of opposition from throughout Scotland was outstanding, yet we managed to retain our title and make it two in a row. “I couldn’t be more delighted. Top of the list comes passion – from not just the family, but from everyone on the Fowlie team. The traditional family shop has recently been raising funds to set up defibrillators in both the shop and the town car park after Bert Fowlie died of a heart attack. His grandson, Gavin, gave up joinery to join the team seven years ago. He said: “To win the title of Scottish Butchers Shop of the Year last year was a big achievement for us. “To go back and win the title for a second year running is just amazing.